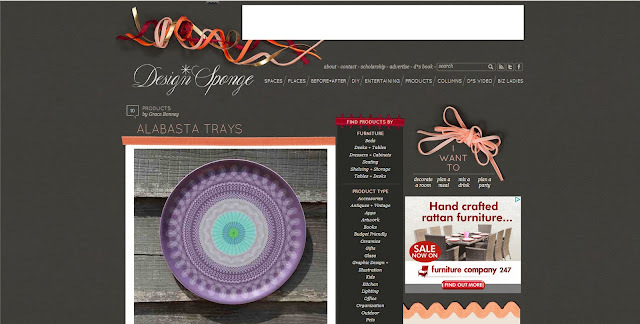 ﻿﻿﻿Much as I like the purple tray shown on the Design Sponge blog, it hasn't made it to the final collection. That colour will be cropping up on other products soon though, as it's a key colour in 2012 interior trend predictions. Other prominent blogs to mention Alabasta trays have so far been Elle Deco South Africa, interior stylist Victoria Metcalf's Style NV, Ideal Home's Home Shopping Spy and Retro to Go. These last two featured trays from the Top Drawer January 2011 launch before the blog was started. Many thanks to all those brilliant bloggers who have featured the products.